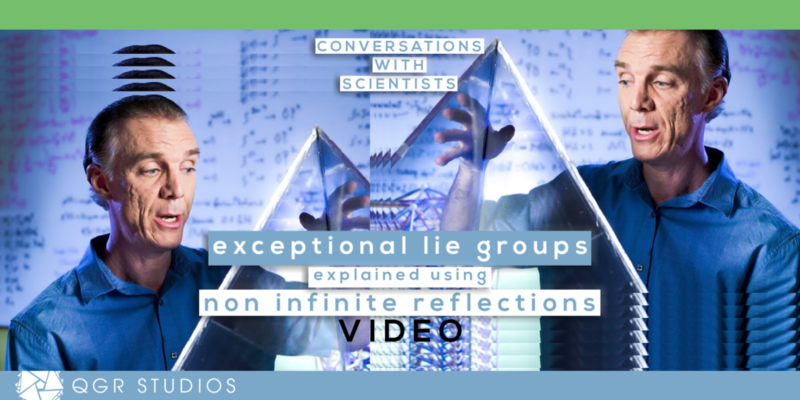 In Quantum Gravity Research’s video ‘Exceptional Lie Groups Explained Using Non-Infinite Reflections’, researcher and QGR founder Klee Irwin discusses exceptional lie groups using an analogy of the type of infinite reflections one would see at a barbershop. E8 can be thought of as the densest and the most efficient way to pack 8 dimensional spheres in an 8 dimensional space. Every time those spheres kiss, they kiss at a point. The E8 lattice is a set of points that are defined by the kissing point of these densest and most efficient packings of 8 dimensional spheres, from which is derived the E8 crystal (out of that lattice of points, by drawing lines or connections). For more on E8, including the 20-Group (which relates to higher dimensions), check out Klee’s blog entry ‘E8 Shelling by Seven-Spheres’ . The 20-Group is a structure that is a fundamental part of the Quasicrystalline Spin Network, our conjectured point space, on which we model our first principles unified quantum gravity theory which we call emergence theory. Klee’s paper ‘Toward The Unification of Physics and Number Theory‘ talks more about E8 and provides an overview of the conceptual framework of emergence theory, an approach to unification physics based on the quasicrystalline spin network.